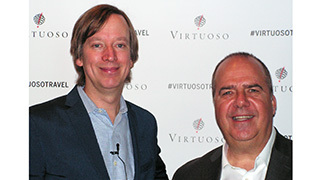 Virtuoso SVP Global Member Partnerships David Kolner (l) and CEO Matthew Upchurch. 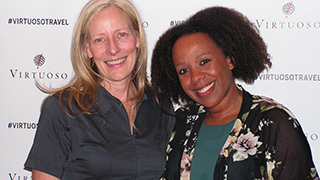 Wendy Davis, Owner, Zebrano Travel (l) and Kemi Wells, Director, Corporate & Leisure Sales for YVR’s North South Travel. 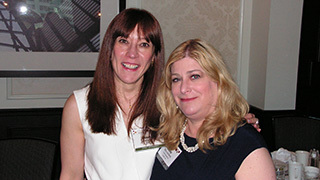 Pouneh Hanafi, VP Marketing, Travel Edge and Betsy Goldberg, Senior Manager, Public Relations for Virtuoso. David Kolner with Vision Travel Solutions Executive Vice President Stephanie Anevich. When Expedia was founded in 1997 and Bill Gates famously said that consumers could throw away their travel agent’s phone number, he forgot something. People like dealing with people. Virtuoso CEO Matthew Upchurch never forgot that. He knew that the pool of travel agents would get smaller when retailers lost their “artificial monopoly” on airline reservations systems, but he never believed that savvy advice from well-travelled professionals would go out of style. The rest is history. The invitation-only Virtuoso, which describes itself as “an agency network specializing in luxury and experiential travel,” now has 1,000 agency locations in 45 countries –185 in Canada – and 17,500 travel advisors. Last year’s Virtuoso Travel Week attracted 5,800 agents and suppliers to Las Vegas. And Upchurch sees no reason for growth to slow. “Five years ago was the first time that one billion people travelled outside their country in one year. Now that number is 1.3 billion. IATA predicts a doubling of air passenger traffic in the next 20 years. People are living much longer – 80% of those who have lived to the age of 80 in human history are alive today, and they are healthy and travelling. I don’t think there are many industries in the world with those growth prospects,” Upchurch said. The travel advisor renaissance is moving at a fast pace in the U.S., Upchurch says, with many millennials choosing travel as a career and many career-switchers entering the business too. The Virtuoso team at the event, which included David Kolner, SVP Global Member Partnerships and Betsy Goldberg, Senior Manager, Public Relations, provided the audience with Canadian-specific consumer data gleaned from a data warehouse representing billions of dollars in travel transactions. The trend of the year in Canada is ‘adventure travel,’ a variation from most other Virtuoso countries where multi-gen travel is the top trend. Of the top 10 summer destinations for affluent Canadian travellers, eight are in Europe. The top five are Italy, the UK, the U.S., France and Greece. The ‘Hot 10’ list of countries seeing the highest year-over-year growth are led by Ireland, Tanzania, Denmark, Croatia, Kenya, Austria, Hungary, Thailand, Ukraine and Poland. Ireland is the only country to make both top 10 lists for affluent Canadian travellers. 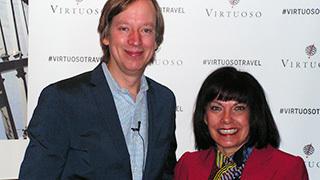 While a certain amount of affluence is obviously a prerequisite for luxury travel – the average daily hotel rate booked through Virtuoso’s hotel partners is $770 – Upchurch says luxury means a lot more than gold taps.